Oil Cleansing Method sometimes referred to as OCM is a way of cleaning your skin without using soap! Your skin produces natural oils called 'sebum' to protect itself from environmental factors which include: dryness, pollution as mentioned above, but also to keep ON healthy bacteria and yeasts and keep OUT unhealthy or unwanted bacteria and yeasts. When we strip that protective layer off your skin too often with soaps, it not only causes our body to produce more oil, but it makes your more vulnerable to colds/flu bugs and/or infections as well. So, how does the oil cleansing method work? You choose the oils based on how your skin feels or your most common skin type. One of the best things about the oil cleansing method is it can be used for any skin type! It's also excellent as a makeup remover! um, yep! Isn't that great?! You may find you need to alter the oil combo throughout the year as the seasons greatly affect our skin, but you may not and that is okay too. Oils that are great choices for using in oil cleansing are: castor oil, extra virgin olive oil, sunflower oil, and almond oil. I personally use organic castor oil and extra-virgin olive oil in my blend. Castor oil is naturally astringent and helps to pull impurities from the skin. Because it is slightly astringent, it shouldn't be used alone on the face. Always blend it with another oil such as extra-virgin olive, sunflower, or almond oil. To give you an idea where to start, here are some oil combinations you can try. 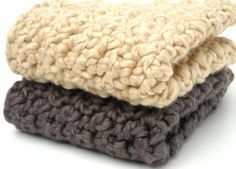 A soft, gentle washcloth is an important part of oil cleansing. Aren't these gorgeous? If only I could crochet. Photo credit: Pinterest. Rub hands together to warm up the oil, then rub onto your face and neck in circular, upward strokes going from nose outwards to cheekbones. Run the hot water, run your face cloth under it to get it wet and hot. Place the hot facecloth over your face to give a steaming effect, repeat this step a couple times to help your skin release any impurities. Rub your face gently with the cloth to remove any excess oil. Follow with a facial toner, and moisturizing facial oil/serum if you choose. Does it work? I found my skin felt moisturized and more elastic within a few days and no breakouts! Some people experience a adjustment period where it takes your skin a few days or a couple weeks to adjust back to the natural levels of sebum production needed to moisturize your skin. Personally, I use a herbal infused oil blend for normal/balanced skin that I made with rose petals, rosehips, and calendula, with some essential oils beneficial for facial skin such lavender. I use oil cleansing most days of the week and my cleansing grains 1-2 times a week. After each treatment, I follow with a facial toner, and moisturizing facial oil as well. You don't necessarily need to do all 3 steps. Start with the OCM and see how it goes. Everyone's skin is a little bit different, so give it a try and give us your feedback. we would love to hear if it works for you! Check out our online shop soon for our facial care collection! We will have cleansing oils, toners, serums and clay masks in 3 different skin type blends! By them separate or as a set!